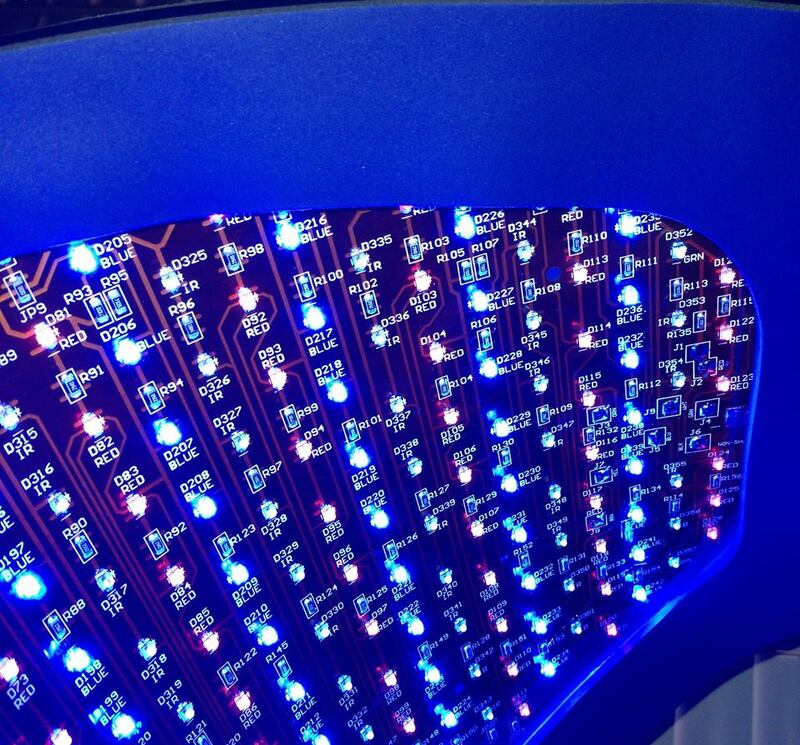 Your Celluma panel has three different types of LEDs; Blue, Red and Near Infrared. 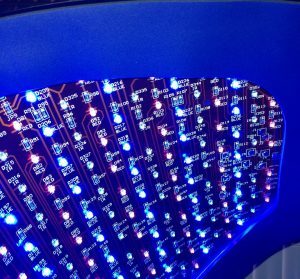 The Celluma panel has approximately 115 Blue light emitting diodes that emit energy in the blue portion (465 nanometers) of the visible light spectrum. Blue LED is FDA cleared to treat Inflammatory Acne Vulgaris. P. acnes is the bacteria that causes acne, and it is known to produce a large amount of porphyrins within the bacterial cell. These porphyrins can be photosensitized with Blue LED to create an oxygen molecule. P. acnes is an anaerobic bacteria, which means it can not live in the presence of oxygen. So when P. acnes is in the presence of Blue LED these porphyrins create an oxygen molecule, which ends up killing the P. acnes bacteria. The Blue, or Acne, setting on the Celluma LED panel. 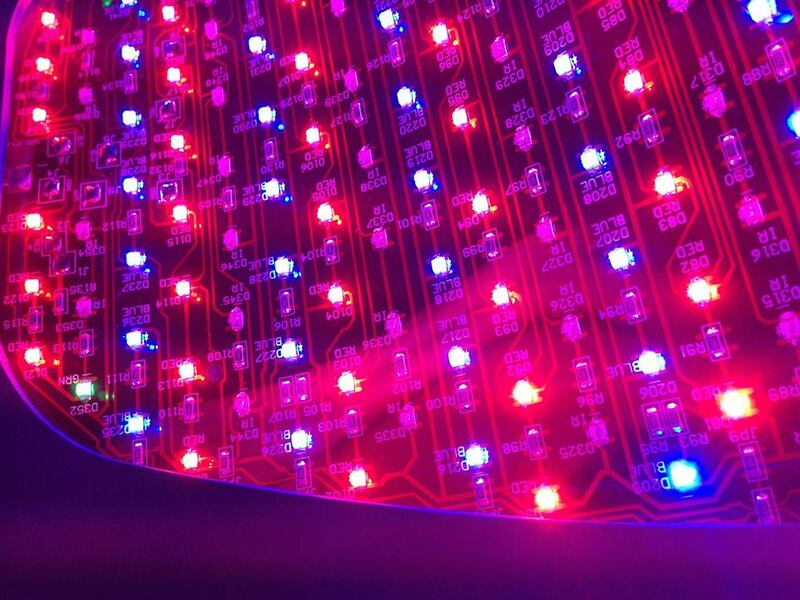 The Celluma panel has approximately 115 Red light emitting diodes that emit energy in the red portion of the visible light spectrum (640 nanometers). Red LED penetrates deep into the layers of the skin, to a depth of 8 – 10 mm. Red LED is beneficial in healing inflamed acne, wounds, cuts, scars and infections. It is also recommended as a post-care treatment after fractional laser, dermal rolling or needling, chemical peels, electrodessication and micro or dermabrasion. 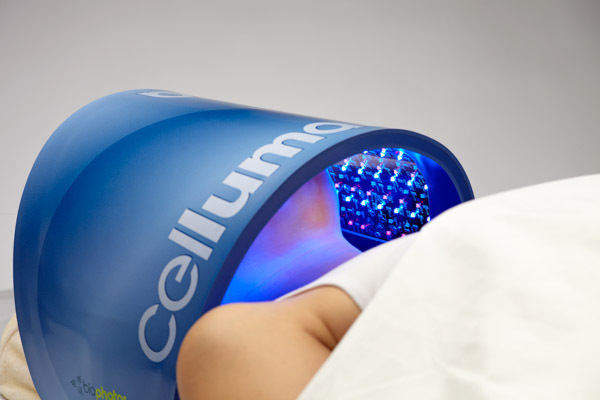 The Red setting on the Celluma LED panel is useful in anti-aging treatments. 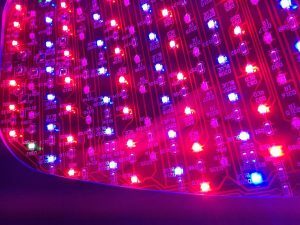 The Celluma panel has approximately 115 Infrared light emitting diodes that emit energy in the near infrared portion of the light spectrum (880 nanometers). Infrared is invisible to the naked eye, but if you look at the lit panel you will see 4 green LEDs on the 4 corners of the panel. These are indicator lights showing you that your Infrared setting is indeed working. Infrared LED penetrates deeper into the skin, to a depth of about 25 mm. Infrared is also beneficial in healing wounds, cuts, scars and infections along with stimulating the deeper tissues, resulting in a healing effect on muscles deep in the subcutaneous tissues. 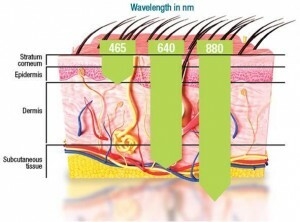 Let me explain how red and infrared assists in skin rejuvenation, but let me offer a little skin science lesson first…. The skin produces several key players that you should be aware of in order to understand how the skin ages. Glycosaminoglycans (GAGs) and glycoproteins are special biological polymers whose key role is to hold moisture in the skin. In addition, the skin produces collagen and elastin, proteins that are responsible for forming the framework of the skin (collagen) and maintaining skin resilience and elasticity (elastin). Increasing the production of collagen and elastin is important in anti-aging treatments, because as we age the amount of collagen and elastin synthesis declines, causing wrinkles and thinning, sagging skin. Fibroblasts are the most common cells that are responsible for producing collagen and elastin, although both of these proteins are also created by other cells in the body. Let’s focus first on collagen. As we age the type of collagen in the skin changes and the amount decreases. There are more than 19 different types of collagen in the body, but the types we are most concerned with as estheticians are Type I and Type III. Type I is the most abundant collagen found in the body, occurring in tendons, bones, skin and other tissues – and is particularly present in scar tissue. Type III is common in fast growing tissue, particularly at the first stages of wound repair, much of this collagen being replaced later by the stronger and tougher Type I collagen. Babies have a large amount of collagen III in their bodies, giving them their soft, supple, elastic skin. As body growth slows down, the amount of type III collagen decreases, while the amount of type I collagen increases until about the age of 35. At this time, the amount of collagen I begins to decline as well. It is important to note that simply having a lot of collagen in your skin is not enough. Even having the right mix of collagen is not enough. It is crucial that the collagen be undamaged and properly deposited. Young, healthy fibroblasts deposits collagen that has a coherent and orderly structure. When collagen is damaged by external factors such as UV rays, free radicals, impaired glucose metabolism (glycation), smoking or other factors, its structure becomes distorted, leading to poor skin texture, wrinkles and other imperfections. This is a very complicated subject, but to state it simply – when you turn 35 – 40, the quantity and quality of collagen fibers degrades, and it becomes very important to boost collagen synthesis as an anti-aging strategy. Elastin is responsible for the ability of tissues to resume their original shape after being pinched or pulled. The red-headed step-sister of collagen, elastin tends to be a neglected topic in skincare due to the excessive focus in the skincare industry on increasing collagen production. Less is known about boosting the elastin content in the skin, yet stimulating its production it is just as important as collagen in your anti-aging strategy. Activating the fibroblasts is the only way to boost collagen (and presumably elastin) production in the skin. Traditionally, we use topicals, peels and lasers to clear up damaged collagen and stimulate the production of more regular, new collagen. Light emiting diodes (LEDs) trigger photomodulation, a non-thermal, non-ablative cellular stimulation. The application of LED triggers a photobiochemical response, activating fibroblasts deep in the dermal and subcutaneous layer to promote healing and repair in these layers. LED photomodulation can also suppress collagenase, a collagen-degrading enzyme that can accelerate our skin’s aging process. In addition, LED can also stimulate the energy-producing mitochondria to enhance wound healing and decrease the inflammatory response. 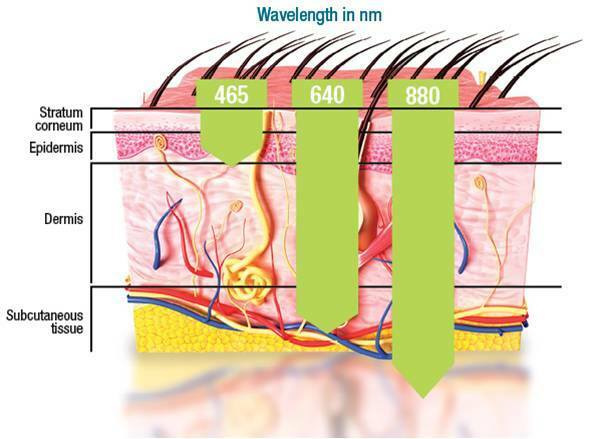 Celluma has the unique feature of combining these three wavelengths of light to create a powerful treatment for our skin therapy practice. The Blue setting also includes a small amount of Red and Infrared, useful in stimulating an anti-inflammatory response. The Red setting has the most equal amounts of Blue, Red and Infrared, which is extremely useful in anti-aging treatments, the management of Rosacea and any other inflammatory issues on the face. The Infrared setting has the smallest amount of Blue, and also some Red for stimulating the fibroblasts between 8 – 25 mm into the skin. To purchase a Celluma panel for use in your own treatment room, visit our website! * A variety of sources were used in pulling together this blog, but most notable were the website www.smartskincare.com and Lasers and Light Therapy, Milady’s Aesthetician Series (C) 2009 Pamela Hill.